Trampoline Tents: Try a different type of camping. Are you having trouble pulling your kids away from the couch or computer desk at night? Why not take them on a camping trip in your own backyard? No need to pack your car with bulky equipment, or to drive out to a campsite far from home—with a Vuly trampoline and tent, you’re already set up for a great night of bonding and fun with your family. We’ve talked about turning your Vuly into a cubby house before, but today we’ve put together some ideas to make the evening that you spend in your Vuly tent extra special. Your Vuly trampoline is already pretty comfortable, so why not just use pillows and blankets for everyone to sleep on? Because you’re not on the ground, you won’t need waterproof sleeping bags to stop rain and bugs from creep up on you. Set up some fairy lights, and turn the inside of your Vuly trampoline into one big, soft and bouncy bed for everyone. If it’s a little bit cold at night, like it is now, collecting the bedding from everyone’s rooms will make your night especially cosy. Of course, you can use sleeping bags if you want to keep the camping experience authentic. No matter what, we promise that you’ll stay dry and snug. Apart from packing sandwiches for your ‘trip’, make nachos with some corn chips, Tasty cheese and a jar of salsa. Enclose all your ingredients in aluminium foil, and place them in a pan over an open fire pit. If you can’t have an open fire, use your barbeque or grill. The cheese shouldn’t take longer than 10 minutes to melt. Let everyone take charge of their own toppings, like sour cream or beans. For sweets, try a twist on the classic plain marshmallows by melting the marshmallow onto two peanut biscuits. Spread on Nutella, and add some chopped bananas, to the middle for a dessert ‘campwich’. Your Vuly comes with games ready to go on the HexVex™ Game Mat. Set up some portable camping torches, and play ‘Trampoline Twister’. Alternatively, and instead of ghost stories, make up funny tall tales by playing ‘Story Hop’ (only without the hopping), and whoever makes the most rib-tickling story wins. You could also come up with a harmony of everyone’s favourite songs on the radio—if your neighbours don’t mind. Spend some of your night star-gazing out on the grass, and see if you can spot classic constellations, like the Southern Cross. Look for one of our close neighbours, like Mars or Venus. See who’ll be the first to spot the brightest stars in the sky—Sirius and Alpha Centauri. You could spend all night looking if your neighbourhood is dim enough! Camping is a wonderful family experience, and a Vuly trampoline tent makes it exceptionally easy. If you’re new to Vuly, keep an eye on our promotions; sometimes we offer a free tent with a trampoline purchase! 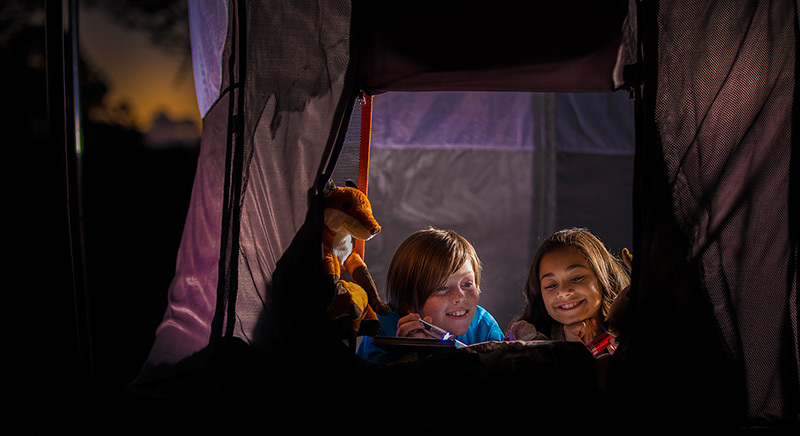 If you’ve used a Vuly trampolines to camp out before, tell us about your family’s night out, and let us know if you have any great suggestions for your fellow campers.